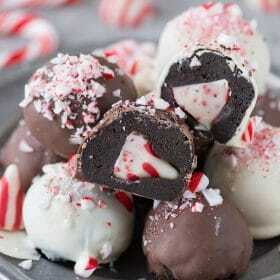 The ultimate holiday oreo balls! 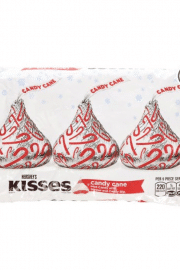 Peppermint Kiss Oreo Balls – each ball has a peppermint kiss stuffed inside! I feel like people start breaking out the oreo balls during the holidays! I really think they are an any kind of celebration dessert, but it’s fun to make them extra christmas-y or extra whatever holiday! One of my favorite ways to make oreo balls extra special is to mini cookie cutters! Instead of rolling the oreo mixture into a ball, I press the mixture onto a baking sheet and use a cookie cutter to cut out my desired shape. 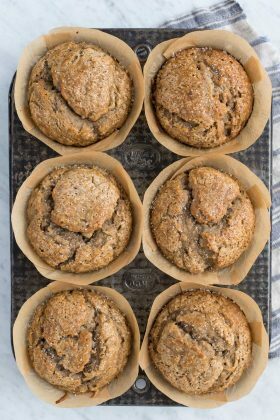 Place the cut out shapes on another baking sheet and put them in the freezer for 20 minutes to harden before dipping them! 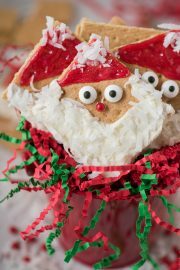 They are so fun – we’ve done this for candy cane oreo balls and gingerbread men oreo balls. The method I used today to make these oreo balls extra special is called…. the stuffing method! 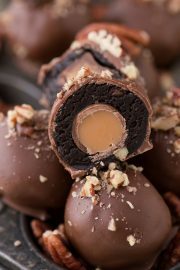 Yes, self explanatory because you stuff the inside of the oreo ball with something delicious. 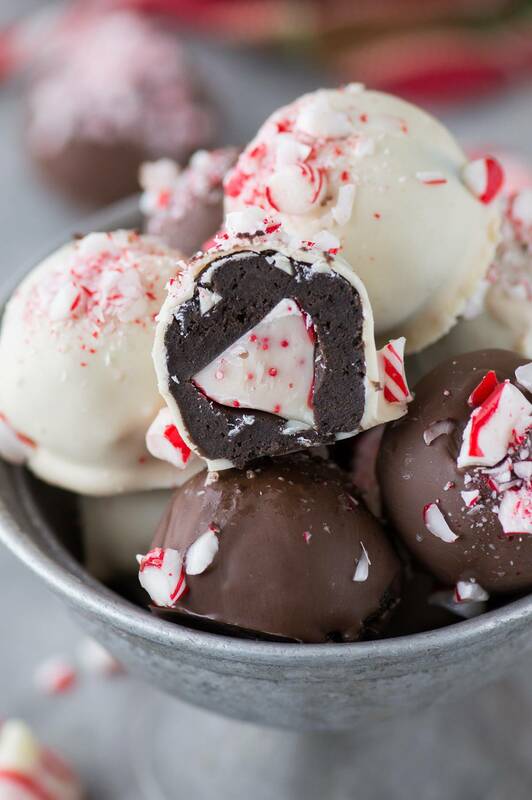 To keep in line with all things peppermint I choose to stuff these oreo balls with peppermint kisses. But it gets even better because I used 2 tablespoons of International Delight’s Peppermint Mocha creamer IN the oreo mixture. Yep. 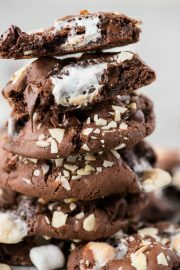 The ultimate chocolate peppermint treat! 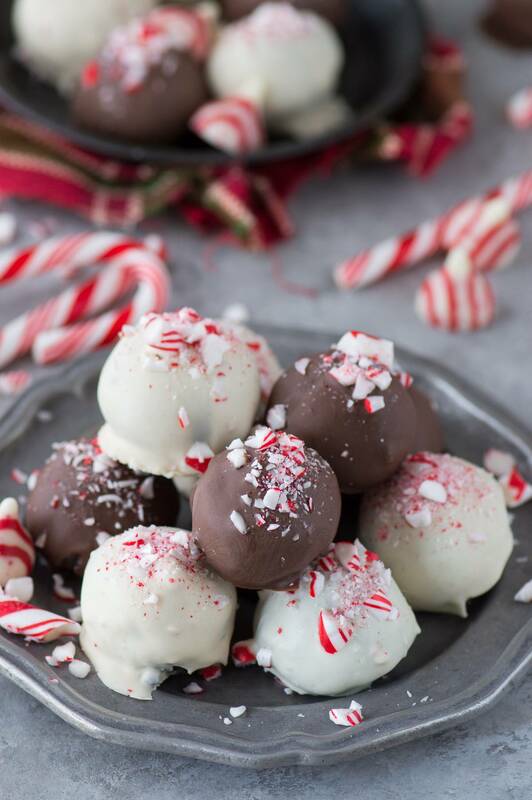 A word of caution: if you top the oreo balls with crushed candy canes and then store the balls in the fridge, the candy canes and outside coating of the balls become sticky. 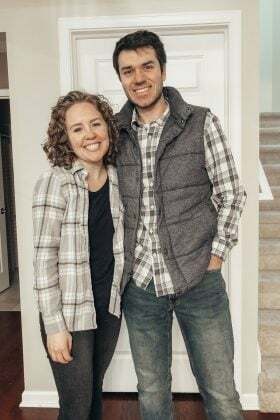 Doesn’t affect the taste – but I wanted to make it known! 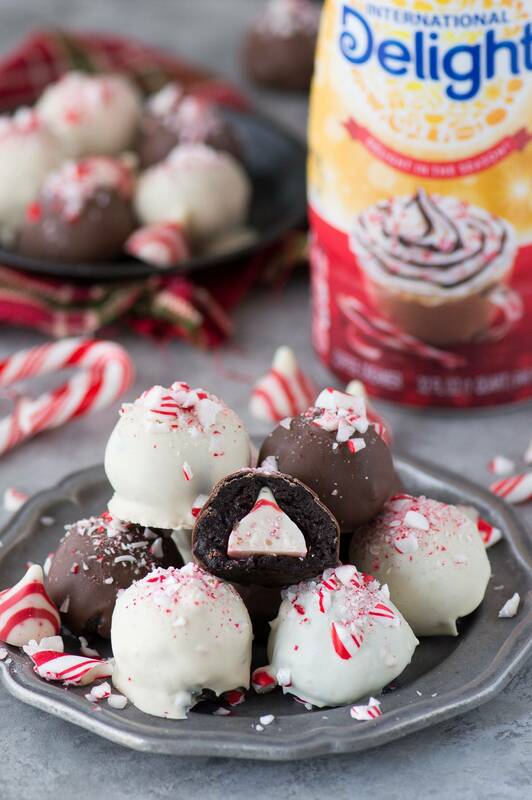 The ultimate holiday oreo balls! 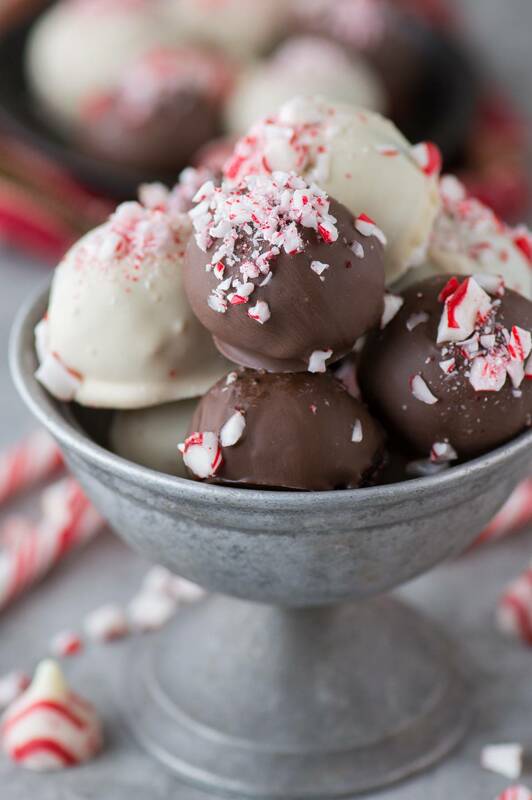 Peppermint Kiss Oreo Balls - each ball has a peppermint kiss stuffed inside! Put half of the oreos in the food processor and pulse until you have oreo crumbs. Add the other half of the oreos to the food processor and pulse again, until all the oreos are fine crumbs. 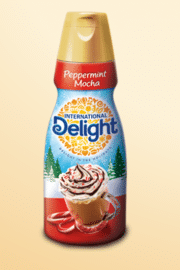 Add the cream cheese and International Delight creamer to the food processor, mix until will blended. 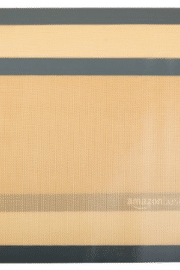 Line a baking sheet with a silicone baking mat. Use a small cookie scoop to form uniform oreo balls. 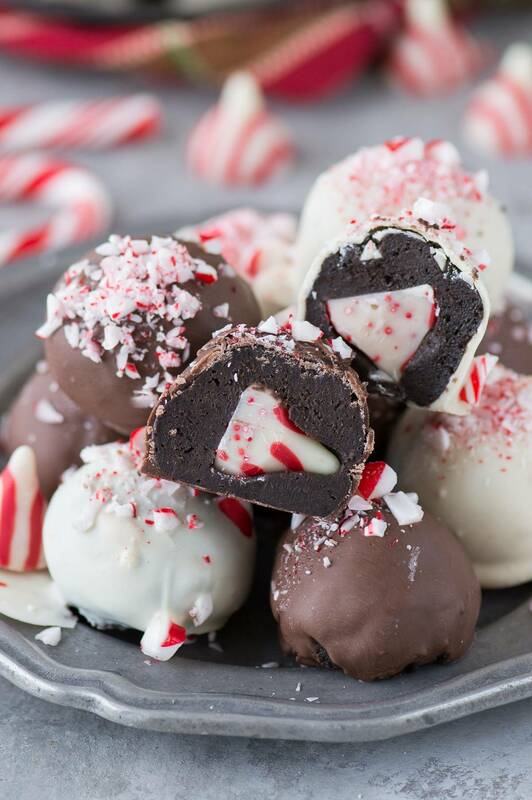 Place a peppermint kiss inside each oreo ball, roll it into a ball and place on the baking sheet. Freeze the oreo balls for 20 minutes. 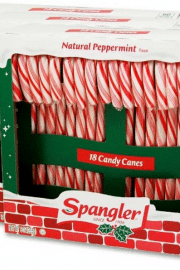 Meanwhile, place the candy canes in a ziploc bag, cover with a towel and use a rolling pin to crush them into small pieces. Set aside. After 20 minutes, begin to melt the chocolate and/or white chocolate almond bark in a small pot over low heat on the stove. Stir occasionally until the bark is completed melted. Remove the oreo balls from the freezer. To dip, place 1 oreo balls in the pot with melted chocolate. Use a spoon to spoon chocolate on top, if needed. To remove the oreo ball, use a fork to lift it out of the chocolate. To remove excess chocolate from the oreo ball on the fork, scrape the bottom of the fork on the edge of the pot to remove chocolate, then put the oreo ball back on the silicone baking mat. Continue this process until all the oreo balls are dipped. I like to let each oreo ball sit for about 1 minute before sprinkling the crushed candy cane on top - that way the candy cane doesn't fall off the oreo ball because the chocolate isn't too hot. Allow them to harden at room temperature. Store in the fridge. The recipe sounds amazingly refreshing so I went out to purchase ingredients. I was able to find everything except the kisses so I purchased peppermint M & M’s. 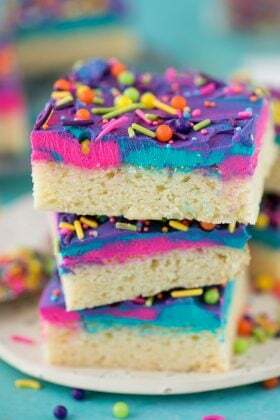 I hope it turns out good because I’m making these for my child’s school teachers for Christmas ???? I bet it will be awesome with peppermint m&ms hiding inside! How far ahead can these be made? If I make them and store them in the refrigerator, they’ll be sitting out on Christmas Eve- will they sweat? What kind of chocolate do you use? I have Baker’s choc. in semi sweet or milk. Wondering what would taste best with mixture. Thanks. 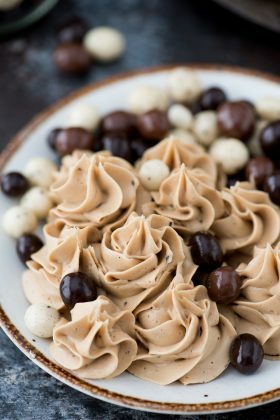 I use chocolate candiquik or chocolate almond bark for dipping oreo balls – that’s the kind of chocolate that hardens once it cools! I live inear Scotland and don’t have access to the peppermint creamer what other kind of stuff I substitute for it. how many calories in one ball?